Everybody knows the story of Jack and the beanstalk, right? Well, I must look like Jack, because people keep giving me bean seeds. One particular year, working overseas prevented me from plating chilli and eggplant seeds into my glasshouse in time for my limited growing season in Bowral. So, that year I bought seedlings. Waiting for my order to be processed I noticed an old gentleman, broad across the shoulders, hands that worked both machinery and a shovel and dressed immaculately in worn, patched overalls and workboots. He was alone lifting bags of grain onto his ute so naturally I helped. That night we went dancing. Christ! Where did that come from?! We didn’t go dancing. What actually happened was, in gratitude he gave me a bag of bean seeds and said; “I’ve been growing beans all my life. My dad’s been growing beans all his life and his father before him. Would you care for a dance…” What the!!! I need therapy. Sorry readers, this ridiculous notion has entered my head and I can’t shift it. It’s a kind of possession; an invasion of sorts where you know the silly little gremlin is there, it’s pointless, trite and annoying. Anyway, the bit about helping load the ute and also being a third generational bean farmer is true. He gave me bean seeds and I have been growing them for 15 years at the time of writing this. They’re amazing; large, full of flavour, heavy cropping and stringless. I don’t know the variety, sorry. One of the great mistakes in cooking greens is undercooking them. When I was growing up there didn’t appear to be any great recipes around for vegetables. They were boiled or baked and plonked next to the meat, with the baked vegetables being far more delicious than their drowned, sodden overcooked cousins. Then, with the emergence of a more modern and thoughtful home cook, came the Undercooked Bean. “Still retains its crunch” was the triumphant catchcry. Wrong. Beans need to be cooked through to release their full flavour along with certain nutrients: more than 6 minutes, but before they turn greyish at around 9 minutes. I was particularly delighted to create this recipe in honour of my special beans. 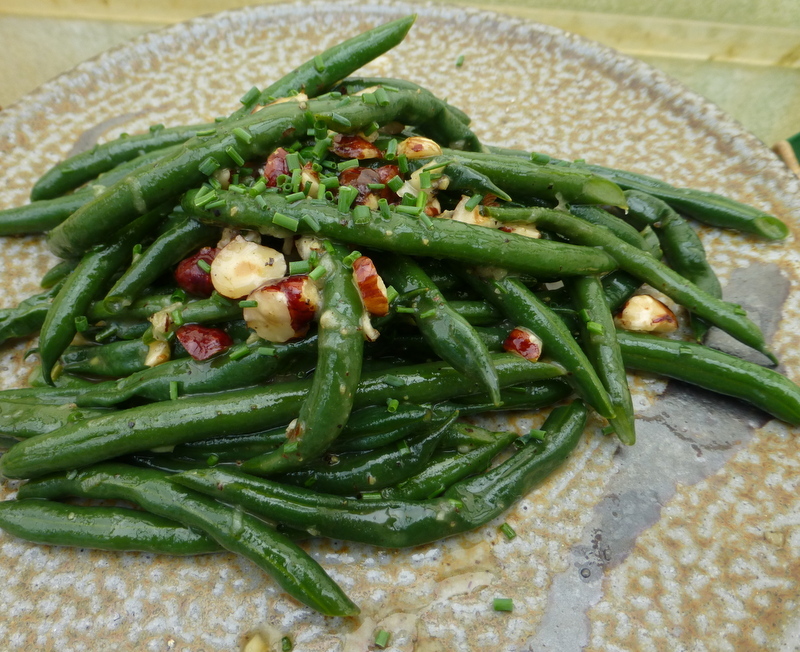 Topped and tailed green French Beans to be boiled or steamed for 8 minutes and taken immediately, drained and while still hot, to be tossed through the vinaigrette until the butter melts and all the beans have a coating.